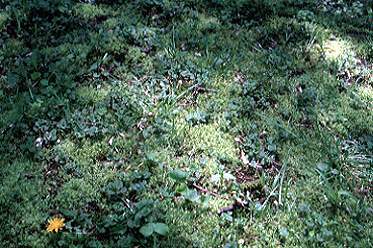 Moss invasions such as this call for adjustments in lawn growing conditions. Moss invading lawns is a common problem. Moss thriving in lawns signals that grass is weak and has thinned for some reason, allowing the moss to take over. There are many potential causes, including excessive shade, compacted soils, poorly drained soils, low soil fertility, high or low soil pH, and poor air circulation. Poor lawn care practices are another source of moss problems. General lack of care, including irregular mowing and little or no fertilizer applications are common problems leading to poor turf growth. Adding limestone is a common "remedy" mentioned for moss control, but is not suggested unless a soil test has shown the pH needs to be raised. Many soils in northern Illinois have high pH values; adding limestone will make this pH go even higher, adding to the lawn's problem. Ferrous ammonium sulfate or ferric sulfate (iron sulfate) can be used to control moss to some extent. The moss will temporarily burn away, but tends to return fairly quickly. Raking out moss is another option; usually followed by reseeding. Modifying site conditions to favor lawn grasses and discourage moss is a suggested way to manage the problem. Too much shade for acceptable grass growth is a common underlying cause for moss invasion. Pruning trees and shrubs to improve air circulation and light penetration is a good starting point. Evaluate the site to make sure the proper grass for the conditions is being used. Take a good look at the soil conditions. A soil test can be helpful, as it could be the soil pH is out of line, contributing to the problem. Reduce soil compaction by core aerifying. This may also help correct drainage problems; although serious drainage problems may require more extensive work to correct. Evaluate lawn care procedures, especially fertilizing. Lawns need adequate fertilization, in particular nitrogen. Established lawns in shady areas need less nitrogen than in full sun. About one to two pounds of actual nitrogen per 1,000 square feet per season is all that is needed in shade, compared to two to four pounds in full sun. Also be sure additional lawn care practices are sound. Excessively short mowing may be a source of the moss problem; a range of 2½ to 3 inches is ideal for most lawn grasses. Mow on a regular basis (based on rate of lawn growth) to avoid removing more than one-third of the leaf blade. Also avoid excessive watering, as this may also contribute to moss problems. Water deeply and as infrequently as possible, based on lawn needs.